Using machinery from Mexico, Mr. Ruiz and Ms. Page produce about a ton of masa every three weeks, using kernels of a natural corn hybrid bred specifically for tortillas, grown in Illinois. In a big tub in the shop’s basement they boil the corn for about an hour in a solution of calcium hydroxide — or slaked lime — that breaks down and loosens the hull, softening the corn and making it easier to digest. (The Aztecs used limestone-rich lake-bed sediment.) The corn is soaked in the liquid overnight, rinsed, then lifted up a corkscrew conveyor into a grinder. The process is called nixtamalization. 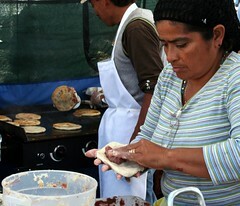 A fine grind becomes tortilla dough; mixed with stock and lard, a coarser grind is used for tamales. I was fairly shocked that in a place like New York City that there wasn't any fresh masa available until this mom and pop operation started a little while ago. As far as I know, I've never had a tortilla made with it, so I don't know if it makes a big difference, but the devotees in the article certainly seem to think so. I'd ask Anna about the joy of fresh masa tortillas, since she spent some time in Mexico, but the traditional version is decidely non-vegetarian... what with the stock and bacon butter... so she probably had to avoid them. A quick Google didn't turn up much in the way of fresh masa sold in Boston, either... no surprise there... but I guess there is a local tortilla factory and restaurant (Cinco de Mayo in Chelsea - according to Chowhound the restaurant is currently closed for renovations but the factory is still operating in Lynn) that sells fresh tortillas in Market Basket stores in Chelsea and Somerville... but are they actually using fresh masa? If it's only recently become available in New York, then I'm guessing they are just using the powdered harina like me... and then what's the point of buying them? Still, I'll keep an eye out. Now I'm hungry for enchiladas.